KUALA LUMPUR: The multi-million ringgit Sandakan Harbour Square is set to transform Sandakan from a sleepy town mostly known for its orang utan sanctuary and natural attractions into a modern, dynamic city on the east coast of Sabah. The seafront urban renewal project, comprising commercial shops and offices, an international hotel and shopping mall, as well as a new city square and waterfront esplanade, will provide ample business opportunities, jobs and space for recreational and social functions. Ireka Development Management Sdn Bhd (IDM) president and chief executive officer, Lai Voon Hon, said the project aims to rejuvenate the central business district (CBD) of Sandakan. "The general topography of Sandakan is limited by the sea and hill at the front and back of the town, leaving limited suitable land for town development. This has resulted in almost no new property development projects in the CBD in the last 20 years," he told Business Times. The project, managed by IDM and supported by the Sabah government and Sandakan Municipal Council (MPK), covers 4.8ha land, including land reclamation. Lai said the project is IDM's flagship project in East Malaysia. IDM, a wholly-owned subsidiary of Ireka Corporation Bhd, is the development manager for London-listed Aseana Properties Ltd. Aseana, which has property developments in other parts of Malaysia and Vietnam, is an associate company of the Ireka Group. 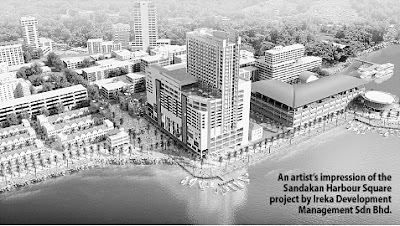 Lai said as an urban redevelopment project, "the Sandakan Harbour Square will be a catalyst for the modernisation of the town, with the aim of turning it into a tourist destination and a bustling commercial centre". He said the third and the final phases of the project, comprising Harbour Mall Sandakan and Four Points by Sheraton Hotel, will be completed by year-end and early next year. Between 3,000 and 4,000 jobs are expected to be generated by the mall and hotel, which has gross development value of RM510 million. Among the confirmed tenants for the mall are Parkwell Departmental Store & Supermarket, Tomei, Bata, SoxWorld, GNC, Levi's, The Body Shop, Jeff Eyewear Space and Gintell. Lai said the whole project blends well with Sandakan's development plan. "Sabah Chief Minister Datuk Seri Musa Aman's vision is to turn Sandakan into an education hub." At the same ceremony, MPK president Datuk James Wong said the education hub, which covers 600ha land, will be home to 15,000 people. He said the new shopping mall will cater to the needs of the student population. Wong believes that the project will attract more tourists to Sandakan. KUALA LUMPUR: Property developer Nadayu Properties Bhd (formerly known as Mutiara Goodyear Development Bhd) is targeting sales next year of RM300 million of its properties in several locations in Klang Valley and Penang. Executive chairman Hamidon Abdullah said the company is about to launch three new projects: Nadayu 28 Sunway, expected to be launched early next month; Nadayu 99 Cyberjaya at the end of this year; and Nadayu 290 Penang early next year. "The Nadayu brand is becoming acceptable, people are starting to identify the name, and people are starting to associate it with some level of quality and delivery. "But we want to put out complete affordable products," he told reporters at Nadayu's extraordinary general meeting (EGM) here today. Hamidon said to date, the company had achieved sales this year of about RM250 million of its mixed development projects. At the EGM, shareholders approved the disposal of three office lots at Dataran Prima with a total floor area of 213.435 sq m for a cash consideration of RM42.6 million. Hamidon said the asset disposal was in line with the company's strategy of disposing of non-core assets to focus on its core business of property development. "The cash from the asset disposal will be used to acquire more strategic land banks for future development," he said. Upon completion of the asset disposal, Nadayu shareholders' funds will stand at RM330.9 million with net asset per share of RM1.44. KUALA LUMPUR: Bandar Malaysia, a mixed development that is being undertaken by 1Malaysia Development Bhd (1MDB) on land situated in Sungai Besi, will begin with affordable houses expected to be launched in December. The entire Bandar Malaysia will include parks, a library as well as public facilities with the key focus on sustainable development, said Chief Executive Officer Shahrol Azral Ibrahim Halmi. "The idea is to start with affordable houses," he told Bernama in an interview. He, however, declined to give further details on the affordable houses, which will be one of the many features on the said land. In June, 1MDB, which is a government-owned master developer for Bandar Malaysia on the 196.6-hectare land, signed a sales and purchase agreement with the federal land commissioner to facilitate the land transfer. 1MDB had said before that Bandar Malaysia would have several attractive elements to further strengthen Kuala Lumpur's global competitiveness as cities compete to attract international investors and businesses. He believed over time, Bandar Malaysia, as well as, the surrounding areas would see a surge in property value, as areas around the "flying zone" would have restrictions on building heights. "Once it becomes a no fly zone, the value of property goes up. There will be more density, which will eventually attract public transportation," he said. Asked on the task of developing the Sungai Besi land, which is currently the base for the Royal Malaysian Air Force (RMAF), he said it would not be easy given the amount of procedures and processes involved. "The land title is now owned by 1MDB but you can't immediately take a hand hoe and start digging," he quipped, referring to the layers of complicity that is involved in developing the land. For a start, 1MDB has to ensure that RMAF has an appropriate place to move their assets and operations as well as they are comfortably functional at the new location, he said. Discussions with regards to the relocation is on-going with the help of Malaysian Armed Force Fund Board and some areas such as Subang, Sendayan, Butterworth as well as Kuantan have been identified for the purpose. It was reported that the RMAF is set to close the Sungai Besi air base from Now 31 and will only be operational for helicopters. That aside, he said the land itself has to be re-gazetted for development. "The land is currently gazetted as a security area. So, that is why you don't see anything happening in the area as yet," he said, adding that all the layers of complexity is what makes 1MDB the ideal developer for the land. "We are 100 per cent owned by the government and it makes it easier to undertake the development and its complexity," he said. Private developers may end up struggling with the cost that may be involved in all the processes, especially the relocation of RMAF itself, he noted. Politicians and policymakers must determine how entrepreneurship and property rights are utilised to promote and achieve a sound balance in environmental and economic growth. DURING an international conference on quantity surveying in Penang last week where she was invited to deliver a keynote address, former International Trade and Industry Minister Tan Sri Rafidah Aziz continued to be in her element. The feisty former minister, who earned the nickname “Iron Lady of Malaysia”, did not miss a beat and held a captive audience. From highlighting the fact that the facilities at an international beachfront hotel where the event was held were less than satisfactory by saying “your microphones here do not rock”, to amusing her audience by using a term “prawn brain” which she has coined before, referring to government officials who cause bureaucratic problems, there were no dull moments. The heart of her speech, however, touched on the green agenda, as she spoke on the need for the issue to focus entirely on saving the environment, rather than it being about politics and power. “The green agenda itself and sustainability issues,” noted Rafidah, “have (also) tended to be hijacked by politicians, in seeking a platform to operate upon and make green issues political capital … and this has already happened in some of the developed countries”. The green agenda, Rafidah said, should not be politicised, as it would detract from the focus required to put into place, policies and programmes directly linked to sustainability. “Today,” she added, “sustainability has emerged as an important factor in international trade, as more consumers, especially in the developed economies are demanding that products which enter their markets, have undergone production processes, which have in turn, met prescribed standards and regimes; all in the context and preservation of the environment and human welfare and the eco-system”. Her call to her audience of the day made up of international quantity surveyors, academicians and several corporate sponsors of the event in being good stewards of the environment to ensure long-term business success, is perhaps a sound and timely lesson which must be taken up urgently in Penang. Citizen groups are becoming more aware and concerned whether the island state is now seeing a further rise in rampant and unbalanced development as high rises, traffic congestion, reclamation projects, more shopping malls, high-rise dwellings and big-ticket commercial and residential property projects are the order of the day. In the name of wanting to turn George Town into an international liveable city and lure top-notch talent to work, live and play, it appears that the issue of development has turned into one which is now becoming too property-centric. With increased permissible density, from 1:1 to 2.8:1 or the density of 87 units per acre, land in Penang is becoming even more valuable. This is because property developers, who are anticipating higher profits, are making a beeline to the island to buy land, and, as with all businesses, to build up to the maximum limit and maximise their profits. Penang’s beachfronts, its pristine hill station, Penang Hill, and the state’s “golden goose”, which is the world heritage city status obtained in 2008, have not been spared the indiscriminate construction and proposed construction of high-rise buildings. Add to this, growing environmental destruction on virtually all spots of the island, amid concerns that the state could head for a housing and construction bubble. The primary responsibility in ensuring that environmental protection is not spawned by political interests, lies with the state. Ultimately, it is the people who must remain at the heart of the green agenda, and this calls for consumers to stand up for their belief systems and use common sense along with sound and independent science, to chart their own destinies in choosing the kind of Penang they want. MIRI: Nagamas International Bhd has been allocated about 2,500ha near Nanning, China, to be developed as a green residential and industrial park. Energy, Green Technology and Water Minister Datuk Seri Peter Chin said Nagamas would undertake the development of the park on a long-term basis under a RM300bil contract. Chin said he would be present at the ceremony to sign the contract on Thursday ahead of the Eighth China-Asean Expo (Caexpo) from Oct 21-26. “It will be historic as this will be the biggest ever development project by a Malaysian company in China and will be a breakthrough in the Malaysia-China relationship,” he said. He said green elements such as sustainability and low-carbon emission would be emphasised in the development of the park. Chin said this year's Caexpo would be significant as Malaysia had been accorded as the country of honour.